Designed in the style of a barn around an open courtyard area. The building was constructed as a hybrid timber frame with masonry outer leaf and additional blockwork to the gables. After spraying, Icynene is trimmed back flush with the timber frame. A vapour control layer is applied to all inner faces. 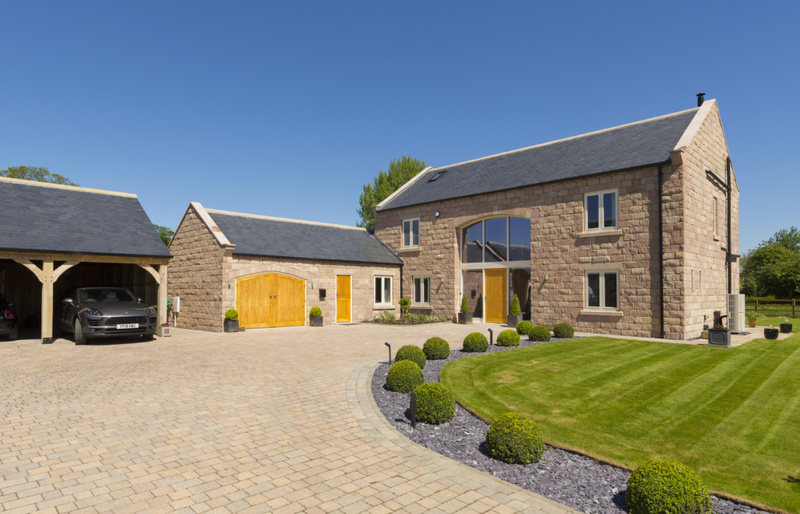 Designed for a private client by Harrogate Architects, Townscape, the high specification property was built in the style of a barn on a spacious, level site, formerly occupied by redundant farm buildings. 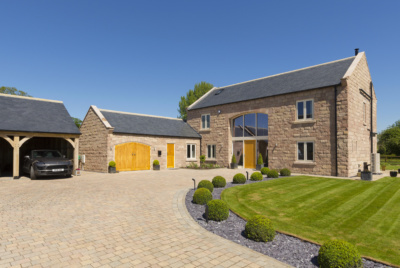 Whilst delighted with the old-world, barn-style of architecture created by Townscape, their clients required a much more up to date treatment for the construction methods and long-term performance of the building – particularly relating to thermal efficiency and low running costs. Townscape looked at various structural solutions and decided on a hybrid, timber frame arrangement with an additional blockwork inner leaf to the gables. An outer leaf of coursed natural stone in a pale buff/rose shade with sawn stone dressings, together with a blue slate roof was specified – a style common to the village. Air tightness and exceptional levels of thermal insulation were also required as the clients were keen to minimise running costs and achieve a low carbon footprint. Townscapes solution was provided by careful attention to construction detailing and the innovative use of a spray applied insulation system from Icynene. According to Icynene, traditional forms of insulation are relatively inefficient in sealing the box, in that they cannot completely fill all voids or seal the interface between the insulation and the building structure. Nor can they cope with small structural movements which will often lead to air gaps. Minimising air leakage is one of the most effective ways of reducing heat loss in a building, as up to 40% of a building’s heat loss can be attributed to air leakage. Icynene “FoamLite” was sprayed directly onto the strand-board backing to the internal timber frame, filling it to a depth of 150mm. As FoamLlite is a “vapour open” foam it allows moisture vapour to pass freely through it, allowing the building to breathe naturally, resisting cold bridging and condensation. Unlike the urethane foams of 20 years ago, modern spray foams such as FoamLite use water as the blowing agent. This means that the reaction between the two components produces C02 which causes the foam to expand. As the foam expands, the cells burst and the CO2 is replaced by air. Consequently, from an environmental perspective, Icynene has a Global Warming Potential [GWP] of 1 and an Ozone Depletion Potential [ODP] of 0 [Zero]. Icynene does not, therefore emit and harmful gases once cured. After trimming back excess foam, a vapour control layer [VCL] was applied to the inner face of the frame, with all joints to VCL junctions, window frames, floor and roof junctions sealed with specialist Tenson tapes. Internal facades were then lined with 57.5mm thick insulated plasterboard and wet skimmed. As the roof space was also to be used as the master bedroom suite, a similar insulation treatment was applied. On the external face of the timber frame, a low e breather membrane – Reflectashield TF 0.81 was applied. This low emissivity membrane is specifically designed to enhance thermal performance of timber framed structures. The combined structural elements created a wall thickness of 516mm overall, with a calculated U-value of 0.17 W/m2K achieved. Because the insulation and anticipated levels of air tightness were so high, Townscape incorporated a mechanical ventilation and heat recovery system [MVHR] into the building. Moist, stale air is mechanically drawn from the kitchen and bathrooms into a system of extraction ducting which passes it through a heat exchanger before being returned to “dry” rooms – lounge, snug, office and bedrooms etc. Space and domestic hot water heating was given a similar forward thinking treatment in the form of a high efficiency, Air Source Heat Pump driving a wet, underfloor heating system to ground, first and second floor rooms. Townscapes, Nick Silcock concludes “Like in the car industry, the design and build of high specification homes like this are at the “Formula 1” end of construction technology. Many of the cutting-edge solutions used today will eventually filter down to mass market homebuilding in ten or twenty years from now”. The property was built over an eight-month period by E & K Construction of Easingwold near York and was completed at the end of 2017. Eight months down the line, running costs for the property are broadly in line with expectations. Having over 30 years experience each in the construction industry Paddy Leighton and Gerry Sheridan set up Greentherm Solutions Ltd to distribute and market the Icynene range of Spray foam Insulation products to the UK market. They identified a gap in the market for an insulation product that would provide high levels of insulation combined with air tightness in one application. Conventional insulations were not capable of doing this and had a detrimental effect on good construction practices and energy efficiency measures. Greentherm became distributors for Icynene and since then Greentherm has developed a network of accredited contractors in the British Isles and Icynene has achieved BBA, ETA and IAB approvals and certifications together with a host of other approvals and recommendations. “We have seen countless examples over the years as to why we made the correct decision as Icynene has surpassed all other products on the market in terms of quality, performance, technical back-up and support in conjunction with innovation and research and development”. Proud to exhibit at the Homebuilding & Renovating Shows. Having over 30 years experience each in the construction industry Paddy Leighton and Gerry Sheridan set up Greentherm Solutions Ltd to distribute and market the Icynene range of Spray foam Insulation products to the UK market. They identified a gap in the market for an insulation product that would provide high levels of insulation combined with air tightness in one application. Conventional insulations were not capable of doing this and had a detrimental effect on good construction practices and energy efficiency measures.